Students taking the Innovative Freshman Experience are learning about imaging science by building an imaging system from scratch. 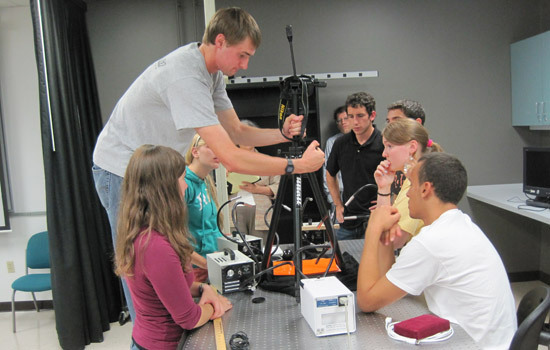 Imaging science major Kevin Dickey adjusts the tripod as the class tests its proof-of-concept prototype. The yearlong class is required for first year students in the Chester F. Carlson Center for Imaging Science, and is open to students in other majors. Mission: Build a device for scholars to illuminate historical documents and manuscripts, shining light into crevices from different angles and mapping surface details. Careful analysis can reveal secrets hidden in the image maps. First-year students at Rochester Institute of Technology’s Chester F. Carlson Center for Imaging Science are up for the challenge. They are part of the center’s Innovative Freshman Experience, where incoming imaging science students are challenged with active learning from the outset. The project—in its first year—replaces the traditional yearlong lecture-and-lab sequence and gives passive learning the boot. Imaging science connects physics, optics, astronomy, remote sensing, electrical engineering, system engineering and computer science to solve problems using energy sources that include sound waves, particles and the full range of the electromagnetic spectrum—from radio and micro waves to visible light, infrared and ultraviolet, to X-ray and gamma rays. Scientists use the different wavelengths to capture signatures from space or to look downward at Earth, peer into the body or scrutinize historical documents and works of art, among other applications. The first Innovative Freshman Experience began with six imaging science students in the fall. By winter term, the group had jumped to 15 students from different majors, including game design, biomedical photography and civil and mechanical engineering. Every year, the freshman class will be given a different assignment. This year’s group has been challenged to build a device used in the preservation of historical documents. The imaging system, known as PTM, or polynomial texture mapping, is a dome-shaped instrument that creates three-dimensional surface maps by imaging an object or manuscript from multiple directions. The device, usually custom-made, is invaluable to professionals working the field of cultural preservation of historical documents. The students started from scratch. They had to understand what they were going to build, its function, and the level of technical performance required for the imaging system to be useful. A pioneer of the technology, Tom Malzbender from Hewlett-Packard, provided background and direction during a Skype session at the beginning of the project. Conversations with end-users from the private sector, museums and the Library of Congress give the class actual examples of how professionals use the device. The team is attempting to build a PTM device that advances the current technology in time for the university’s annual Imagine RIT: Innovation and Creativity Festival in May. “We want to extend the capability and go beyond the visible range into shorter wavelength radiation in the ultraviolet and longer wavelength radiation into the near infrared,” says Joe Pow, associate director of the Center for Imaging Science at RIT and class facilitator. The class—capped at 20 students—is required for imaging science students but is open to freshmen from any major. Students from other disciplines who enroll in only a session or two help create the changeable team dynamics found in the workplace. “It’s part of the process,” Pow says. Phoenix Rodden, a game design and development major, found out about the class through Kevin Dickey, an imaging science student who lives in the same dormitory. “I decided to join for winter quarter because the project was in need of someone who knows programming. I fit the bill,” Rodden says. “That’s the kind of environment the class is fostering: If you don’t know it, figure it out. If you can’t figure it out, there are plenty of people to help you. Ultimately, the onus is on the students, who must learn to access the rich learning community available to them in the Center for Imaging Science. For instance, they can request lectures from faculty on topics they need to know more about to complete their assignment. The class also has access to a lab 24 hours a day where they can build and test the imaging device. Design reviews at the end of each quarter serve as their final exams and gauge their progress. “The concept is for the students to learn through doing, for them to seek out knowledge on their own, as they need it, and at the same time apply what they are learning in their traditional math, physics or writing classes in an immediate and purposeful way to build a system, in this case an imaging system, that will be directly used in the field. And to do all this essentially on their own,” Baum says.